Newsright is a beautiful clean modern design and powerful admin options. Feature-rich WordPress premium HD (retina-ready) magazine news theme for all sorts of publishers. Great for review, news and blog sites, with video and slideshows. The Theme uses the best clean seo practices, it’s fast, simple and easy to use. We also support Responsive Google Ads. 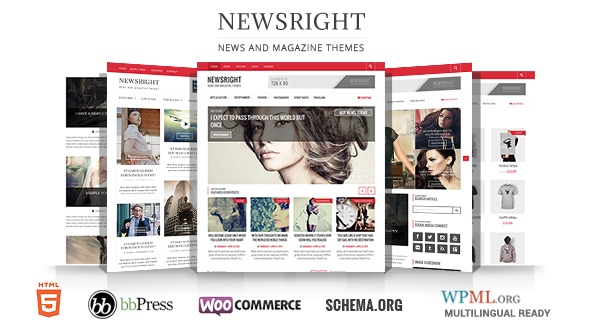 Newsright is also compatible with WooCommerce and bbPress, on-click Theme Options, Resposnive design, unlimited layouts, different post layouts, , comes with over 500 Google Fonts, a Featured Slider on Homepage , Social Media integration and so much more! Newsrightis ready to start working, out of the box, with a multitude of theme options, custom widgets and custom classes to help you personalize your environment. it is well suited for both beginners with no coding knowledge and developers. Tabs Widget Most Popular, Recent, Archives. 21 Pre-Defined Background Patterns .